First Real Estate Investment Trust (SGX: AW9U) is a Singapore-listed healthcare REIT that is sponsored by PT Lippo Karawaci Tbk. Lippo Karawaci is Indonesia’s largest broad-based listed property company and it operates the Siloam Hospitals Group, one of the largest hospital chains in the country. Siloam is Indonesia’s most progressive and innovative healthcare provider which has achieved international standards. First REIT is managed by Bowsprit Capital Corporation Limited, the Trust has successfully built a high quality and diversified asset portfolio of 18 properties comprising 14 located in Indonesia, three in Singapore and one in South Korea. The properties are collectively valued at over S$1 billion. The stable income-producing portfolio covers the full scale of healthcare real estate, including hospitals, nursing home, rehabilitation centre and other healthcare-related facilities. First REIT owns and manages one of the fastest growing sectors in Indonesia. Does that make First REIT a good investment? First REIT is managed by Bowsprit Capital Corporation Limited. 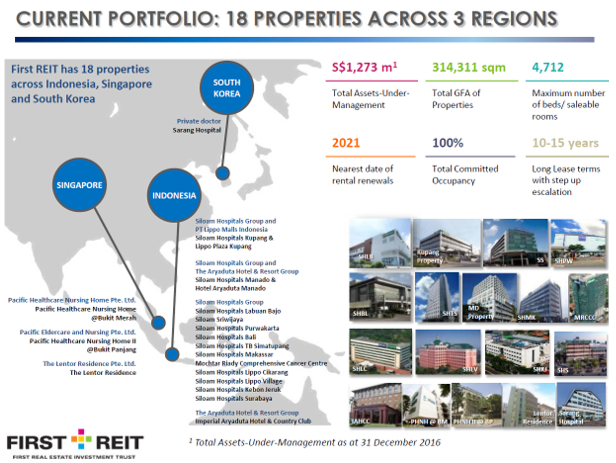 The REIT has a high quality and diversified asset portfolio of 18 properties comprising 14 properties located in Indonesia, three in Singapore and one in South Korea. 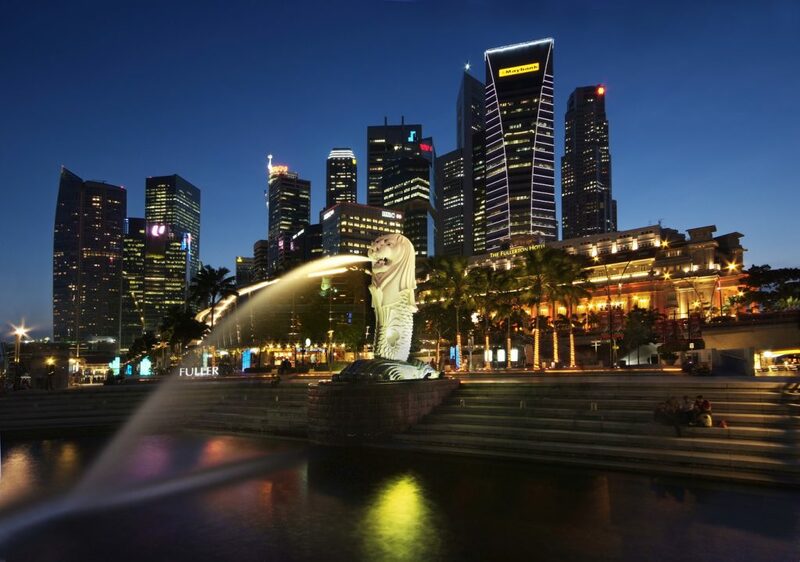 The properties are collectively valued at S$1.3 billion. The stable income-producing portfolio covers the full scale of healthcare real estate, including hospitals, nursing home, rehabilitation centre and other healthcare-related facilities. Below is a list of the properties that First REIT owns. The majority of the hospitals in its portfolio are in Indonesia and are run by Siloam Hospitals. This is majority owned by First REIT’s sponsor Lippo. I believe this gives Siloam and First REIT more stability as the parent company can look out for both companies when structuring deals. First REIT leases are also very long term in nature ranging between 10-15 years per lease agreement. As seen from the diagram above, the earliest renewal is only in 2021. 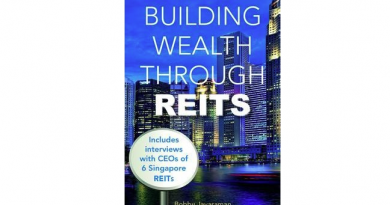 Also, the REIT has had 100% occupancy since it was listed on the Singapore Exchange. This is because First REIT only has one tenancy per hospital premises. This is unlike shopping malls or commercial REITs where each individual office or retail space is leased out separately. From the diagram above approximately 60% of the leases still have more than at least 10 years remaining. Moving on, one of the big concerns investors would have is currency risk. On this front, the above diagram explains First REIT’s lease structure. 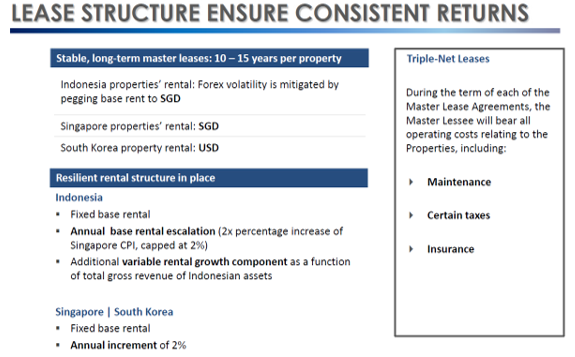 First REIT collects rental income in either Singapore or US dollar. This essentially means it is removing the currency risk that it potentially faces. In addition, its leases are “Triple nett”. This means that the master lease is responsible for costs such as maintenance, insurance and certain taxes. Lastly, First REIT also has a built in rental escalation clauses which are tied to the consumer price index (CPI) or in other words inflation. Thus First REIT has passed the currency and inflation risks over to its tenants. First REIT has a total of 18 properties across 3 countries, spread over many cities. This allows the REIT to have a resilient earning base as no one property is responsible for a big chunk of revenue or earnings. In addition to a diverse earnings base, First REIT’s leases structures have inbuilt rental escalation clauses that allow it to grow year after year. This is a positive for investors as growth is pegged to inflation, meaning investors should be rest assured that growth in distribution should keep pace with inflation, provided nothing happen to the tenants. 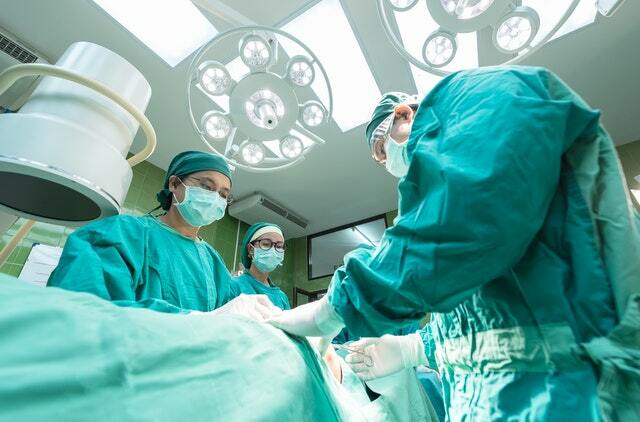 Other than its currently diverse base, First REIT also has the first right to refusal for some 25 hospitals and numerous more in the pipeline linked to its sponsor. Source: First REIT presentation slides. 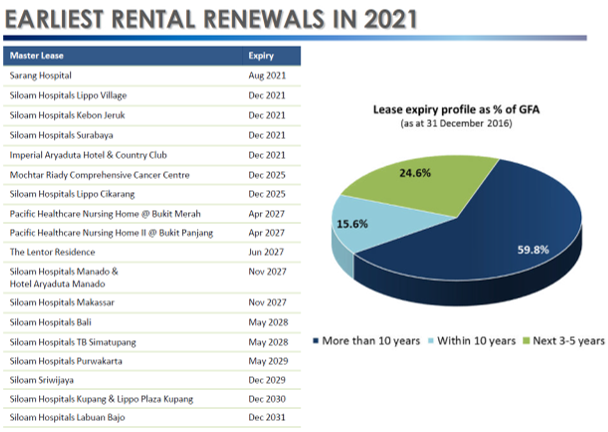 What this means is that First REIT growth is not dependent only on rental increases by the REIT can also grow by expanding its property portfolio. The next key opportunity for First REIT is the fact that hospitals are required whether there is a recession or not. This means that the REIT is largely recession-proof due to the nature of business its properties are used for. 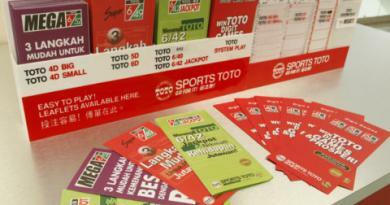 This is unlike, retail spaces that have been facing pressure from growth in e-commerce. And this has led to a dampening effect on demand for retail spaces. One of the key risks for First REIT is that 13 out of its 18 properties are leased to Siloam Hospitals. This can turn into a big problem for the REIT should Siloam run into financial difficulties and is not able to pay its rents. The bright side of this risk is that the parent company for both First REIT and Siloam is Lippo Karawaci which is a property conglomerate in Indonesia. Should either of these entities run into difficulties, the parent company might be forced to jump in and bail them out. 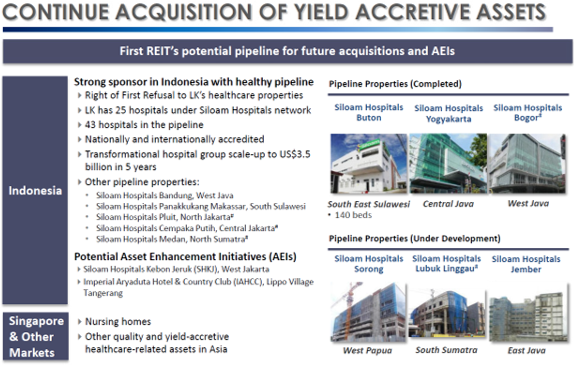 The majority of First REIT’s income comes from hospitals in Indonesia. This is a huge positive as the country is growing its GDP at approximately 5% per year. This means that as more people move into the middle-class segment healthcare spending should increase as well. However, this huge opportunity brings with it risks as well. One is the slowdown in the growth of the healthcare spending. That could lead to a drop in Siloam’s business leading to a tighter financial position for the hospital operator. Also in the event of a slowdown, more discretionary procedure will be put on hold which could further reduce the earnings of Siloam Hospitals. And being the biggest leaser of First REIT properties, this could have a spill-over impact on First REIT. First REIT currently trades at a Price to book (P/B) ratio of 1.2 and spots a 6.3% distribution yield for its investors. Both metrics are comparable to its five-year average of 1.3 P/B ratio and 5.4% distribution yield. REITs are typically measured by investors in term of its yield and First REIT has one of the more attractive yields within the S-REIT space at the moment. The information provided is for general information purposes only and is not intended to be any investment or financial advice. All views and opinions articulated in the article were expressed in Ketz’s personal capacity. It does not in any way represent those of his employer and other related entities. Ketz owns First REIT.